So we know we just gabbed about everybody hitting the road soon – and we hate to sound like a broken record – but our favorite Dream Creamers are about to set out again after this weekend and we won’t see them again ’til September 21 [at the Ty Segall – Mikal Cronin show] We figured we gotta throw together something quick so we can all get our fix before they leave though — so this Sunday night [Aug. 21] we’re gonna ball out at The Basement. 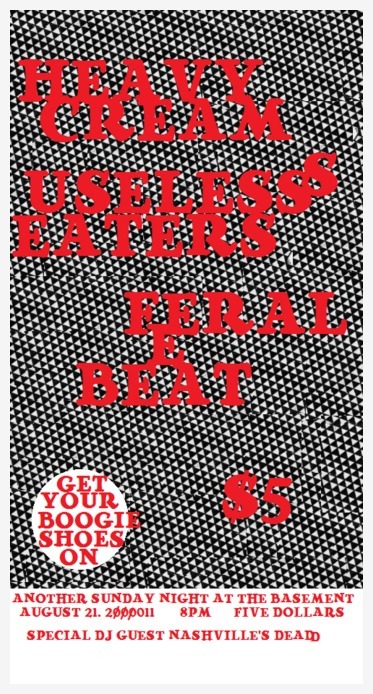 Useless Eaters and Feral Beat will round out the bill and that’s a pretty good round-job, right? No screwballing around happening here. Along with that, we’ll be on the ones and twos in the back of the room — so bring your earplugs. Come see the gals one more time while you can, otherwise you’ll have to wait another month to get your creamy kicks.